Could you feel Karen’s strong passion for her social cause? What do you think has been the driving force for her work? What personal and career risks has she taken to pursue her dream? Would you have done it if you were in her place? Now enjoy this 12-minute TED Talk video. Karen Tse is the Founder and CEO of International Bridges to Justice. As a social entrepreneur, she has been honored as an Ashoka Fellow, Skoll Fellow, and Echoing Green Fellow. She also received the International Human Rights Award in 2008. With a personality that has charmed even the most immovable of leaders, Karen Tse has managed to change the fate of millions who face human rights abuses in Asian countries. Born in 1964 in the U.S., Tse has made it her mission to ensure that people in developing countries are protected under human rights laws, specifically in Cambodia, China and Vietnam. To explore her interests in the humanities, Tse received her formal education from some of the most prestigious universities in the world – including Harvard University School of Divinity and the Tianjin Foreign Languages Institute. Karen first developed her interest in the cross section of criminal law and human rights as a Thomas J. Watson Fellow in 1986 after observing Southeast Asian refugees detained in local prisons without trial. She became passionate about human rights violations while still in college, so as soon as she graduated, Tse pursued a career in law that would aid her in her quest to make a difference. 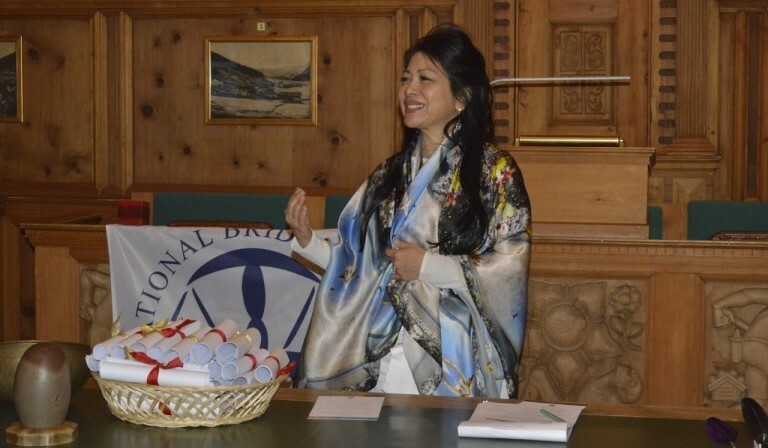 Undeniably intelligent, Tse wisely combined her innovation and drive with her skills for persuasion and founded her organization, International Bridges to Justice, in 2000, for which she is currently the CEO. To say that changing the justice system in developing countries is a challenge would be an enormous understatement. Tse’s undertaking with International Bridges for Justice, and the successes she has experienced with the organization, are nothing short of spectacular. “Not so long ago, as a lawyer working for the United Nations, I experienced a dramatic shift in my perceptions of approaches to international human rights and issues concerning the detained and imprisoned. I remember peering through the bars of a cell in Cambodia and talking with a young boy who had been detained, tortured by the police, and was languishing in prison, confused and daunted by what would or could happen next. Like most prisoners in Cambodia, he had no lawyer or human rights worker to defend him or safeguard his rights, and he had no pending trial date to determine his guilt or innocence. “I flashed back to ten years before, to my college days of organizing letter-writing campaigns for political prisoners. We had demanded that they be free from torture and be granted their right to fair and speedy trials. But as I came face to face with this young boy, I realized that neither I nor my fellow students would have written a letter for him. He was not a political prisoner; he was just an unimportant 12 year old boy whose mischievous behavior, trying to steal a bicycle, had landed him in this quandary. “The prison guards were nice enough and did not appear too concerned that I was talking to this young boy who bore obvious signs of beating. They didn’t have much to hide: after all, use of force to extract confessions was just a part of standard police operating procedures. As I looked into the face of the boy, I felt myself wondering where we had gone wrong. I wondered why his interests, those of a “common” and “undeserving prisoner” had not made it into my “mission” statement. “Perhaps ten years ago, there might have been precious little that we could have done for this boy. Since that time, however, governments throughout Asia, including Cambodia, Vietnam, and China have passed new laws outlawing torture and providing citizens with basic rights, including their right to a defender. It was precisely because this boy was not a political prisoner, someone the government had any interest in, that he could easily have been the beneficiary of focused international attention. Citizens like him were unimportant to the government and the denial of their basic rights now had less to do with present policy and more to do with vestiges of an old legal system that formerly tolerated and even condoned this denial of rights. Is Karen a Social Entrepreneur? In the common usage of the term ‘social entrepreneur’ in North America and Western Europe, the answer would be a simple yes. But in Hong Kong, there is still much confusion surrounding this term. Some people think that social entrepreneurs (社會企業家) are those who have set up social enterprises (社會企業) to address a social issue. But in fact, social entrepreneurs are simply individuals who are passionate about certain social issues and employ an entrepreneurial approach to tackling them. Typically, they don’t care about the organizational vehicles they use as long as they serve the purpose; so they might set up a social enterprise, or a non-profit organization, or even a for-profit organization, or a hybrid organization. For example, among the 3,000-odd Ashoka Fellows, roughly half of them have set up some sort of social enterprises while the other half created various forms of non-profit organizations. And they are all known as social entrepreneurs. Karen has chosen to set up a non-profit organization as the nature of her work could hardly generate income to sustain itself. Is Karen your Role Model? It is of course up to you to decide. She may or may not be. But I would like to take this opportunity to say something about ‘role models’. From my limited experience in the social sector, I have observed that those who are doing exceptionally great things usually benefit from learning from some role models. When I tried to delve deeper into this phenomenon, some obvious answers surfaced. I would like to summarize them below. When you have a role model…. Karen Tse of International Bridges to Justice – for her courage and commitment to tackle an almostintractable social issue. The late Lord Young of the Young Foundation – for his ingenuity in creating scores of innovative institutions such as the Open University, Consumer Council, and School for Social Entrepreneurs…. Header Image from International Bridges to Justice’s website, an article at Jan 2017.